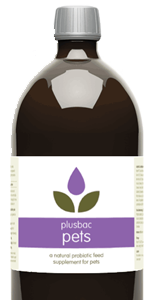 Plusbac Pets is a natural fermented herb pet feed supplement designed to maintain your pets well being. Suitable for all pets, dogs, cats, rabbits, puppies, kittens, guinea pigs and poultry. Add the required amount of Plusbac Pets to the animals daily feed and mix thoroughly. Ensures normal digestive function (More beneficial microorganisms in the gut). Maintains healthy appetite and weight by balancing nutrient production and absorption. Optimises wellbeing, general condition and temperament. Helps to reduce stress and therefore maintain correctly functioning gastro intestinal system. A totally natural way to help maintain an optimum immune system. Aids metabolism, improving nutrient production and absorption. As a general guide we recommend adding the following amounts to your pets feed once a day. What is in Plusbac Pets? Traces of herbs include: Carawy, Yarrow, Aniseed, Fennel, Birch Leaves, Goldenrod, Rosemary, Peppermint, Marshmallow root, Raspberry leaves. Number of CFU Min 2.91Million per ml. How do I store Plusbac Pets? You need to keep your Plusbac Pets stored in temperature between 6 to 20 and away from direct sunlight. The shelf life of our probiotic is 9 months. Plusbac Pets has a pH value of between 3.3 and 3.6. Do not use if the pH exceeds 3.8. What is Plusbac Pets good for? Plusbac Ltd accepts no responsibil­ity for any loss, injury or other claim that may be made in connection with the supply and application of Plusbac Pets. Distributed in the UK by Plusbac Ltd.